Lord Botetourt Coffin Plate Returns - Come See It! The Special Collections Research Center is installing a new exhibit Friday, October 12th, to both celebrate the return of Lord Botetourt's coffin plate to the University Archives and commemorates the anniversary of his death. This marks the first time it has been on exhibit on the William & Mary campus since 1956, when it went out on long-term loan to Colonial Williamsburg. 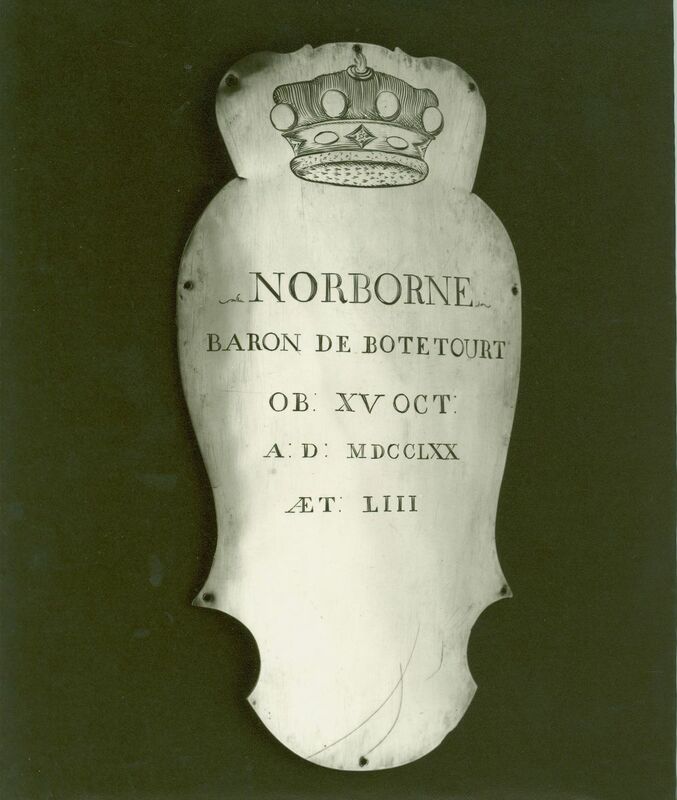 Norborne Berkeley, 4th Baron Botetourt, was Governor of the Virginia colony from 1768-1770. At the time of his appointment, Lord Botetourt was an important figure in court and political circles in London. He arrived in Virginia amid great rejoicing and took an active interest in the academic life of the colonial capital, serving as Rector of the Board of Visitors of William & Mary and establishing the Botetourt Medal. His sudden death on October 15, 1770 was an occasion for mourning throughout the colony. His obituary described him as “the best of Governors and the best of Men.” He was honored with a splendid funeral and buried in a vault underneath the Wren Chapel. On July 20, 1771, the House of Burgesses resolved that a marble statue of Lord Botetourt be erected in his memory. Richard Hayward, a well-known English sculptor, was commissioned to execute the statue under the direction of John Norton, a Virginia merchant in London. Hayward created the statue using a wax medallion of Lord Botetourt as a model. The 2,000 pound statue arrived in Williamsburg in June 1773 and was placed upon the piazza of the Capitol, where the sculptor’s conception – a figure clothed in the court dress of the times, standing in the manner of an orator with his right hand holding a rolled parchment – was “universally admired.” On the pedestal, Hayward carved the Botetourt coat-of-arms, a relief showing Britannia and Virginia meeting over an altar inscribed CONCORDIA, and three inscriptions to Lord Botetourt. In 1797, the President and Professors of William & Mary purchased the statue for $100. It 1801, it was placed in front of the Wren Building. It remained there for 157 years, except for a brief period during the Civil War when it was placed for safekeeping on the grounds of Eastern State Hospital. The statue was removed in 1958 and placed in storage to protect it from vandalism and weathering. The statue found a permanent home on display in the Botetourt Gallery of Swem Library, which held its official opening dedication in 1966. It remains there today and can be viewed whenever Swem Library is open. A replica of the statue was commissioned for William & Mary’s Tercentenary celebration. The new Lord Botetourt was dedicated on October 23, 1993. In addition to his coffin plate, the exhibit will include coffin hardware, photographs, and broadsides. It will be open through the month of October.